What is an Adjustable Gastric Band Re-fill? An Adjustable gastric band Re-fill is carried out in an outpatient clinic setting. 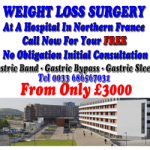 It is a relatively quick procedure but must be performed by a qualified practitioner who is specially trained to make Adjustments to the Gastric Band. Adding or removing fluid from the gastric Band makes adjustments to make sure that the gastric Band is working correctly. The fill is a saline solution which is applied by injecting the fluid by way of a small port, which is situated just below the surface of your skin on your abdomen. Our practitioners are specialist in Adjustable gastric band fills. We currently provide post-operative care for patients who have had a gastric Band fitted at one of our specialist bariatric surgery centres in France and Belgium. Our UK fill centres are situated in London, Exeter, Birmingham, Manchester, Leeds, Newcastle Upon-Tyne, Glasgow, Edinburgh, Belfast and Dublin. Our practitioners offer counselling and support as well as adjustable Lap Band Fills for patients who have made the decision to control their weight with the help of a Lap Band. We consult with dieticians and practitioners who specialise in this field of healthcare and are part of a growing network of health care professionals based in Belgium, but are leading the way in developing what is a relatively new and promising area of health care at our locations in the UK. The gastric Band is usually filled for the first time six weeks post surgery. The reason for this is to greatly restrict the stomach’s capacity for food. After surgery you have to be prepared to adopt a totally different eating pattern. A few people find this adjustment the gastric band diet and changes to their eating habits difficult to accept. Because each patient has different requirements some may wish to have a slight reduction to the adjustable band in this early post-operative period and this can be done if needed. Typically, you will need to have a review of the gastric Band every 6 months. There are also times of life where you may wish to be more or less restrictive about what you can eat. You can come for Adjustable gastric Band Re-fill to one of our centres, more often than 6 monthly, when you wish to.